Another, even more exciting dream is in the works for 2008. 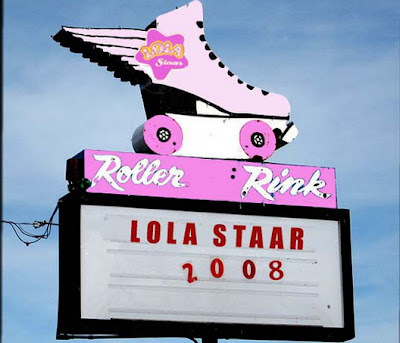 A preliminary manifestation of Lola's dream to build a Roller Rink in Coney Island may take place this summer! We will keep you updated as Lola's exciting dream unfolds! A "preliminary manifestation" that "may take place this summer"? We understand that to mean a temporary roller skating facility for the summer. Will it be on city-owned property? On the land that Mr. Sitt cleared last winter that it now sitting unused and vacant? In the meantime, State Sen. Carl Kruger held a press conference on Friday to say that there would have to be a long environmental review process before the city could "alienate" (or de-park) 9.6 acres of land next to KeySpan Park that currently is classified as a park. (In reality, it's a parking lot, plus the ugly and underused Abe Stark Ice Rink.) More thoughts on whether an environmental impact study will be needed to change the status of a baseball stadium parking lot from "park" to land for development, tomorrow.